October Studio AE Blog Hop from Technique Tuesday | A bit of this. A bit of that. It’s Studio AE Blog Hop time once again! Hooray! This month, we are using the new Hello December by Ali Edwards stamp set. I think this set is great for December Daily type projects and for Christmas cards. Technique Tuesday is not releasing a December Daily set this year, but they have released a number of Christmas themed sets from Ali over the last few months. With those sets and this one, I am feeling pretty covered in that department! I decided for today’s hop to make something not Christmas or December-y with the set.I really wanted to try to stretch the limits of it so I made this little scrapbook page of a favorite picture I took while at the fair last month. I used one of the set’s borders to stamp up the rainbow background on cardstock. I stamped one phrase from the new Studio AE set (“Favorite Memories”) in the middle of one of the red borders. Then I pulled out some stamps from other Technique Tuesday stamp sets and stamped words from them in the others. Those sets were: Incredible by Ali Edwards; Seriously Rad; In a Nutshell and Awesome. I also poked holes in a couple of the borders and tied solid twine through them. I finished off the page with a little journaling, completed on my trusty typewriter. I do a lot of journaling by hand and on my computer, but it’s nice to mix things up once in awhile with the typewriter. So that’s all I have for today. Be sure to check out the blogs of everyone hopping today. As always, be sure to comment as you go. We are going to give away one $25 gift certificate after the hop. To be eligible to win, all you need to do is comment during the hop! The lucky winner will be announced on the 15th on the Technique Tuesday blog. Happy hopping, and thanks for stopping by today! Teri – I love the “old school” typewriter for journaling 🙂 So very cool. And I love your stamp mash up and stretching beyond winter holidays for this set. Awesome!!!! I really love the way you used this stamp set !!! So much fun and colors in this layout, I LOVE it. Thanks Teri for showing another way to use a Christmas stamp, not just for the holidays! I love the stitching on the layout, too! Amazing use of these stamps. I love your layout! You are such a gifted artiste! Thanks for sharing. What a fabulous idea!! I love this! I actually didn’t notice at first that this set came with two blank ribbon stamps…which makes it so much more versatile, as you layout shows! Great page, really shows the fun this stamp adds to it! Thanks for the inspiration! Love how you used this December set of stamps on a non-December layout! How cool is that stamp set? Love the way you layered it. Great example using these stamps on a regular layout. I thought it was a great stamp set before but now it’s even more versatile. Love the new stamp set and how you used it. Awesome! Love how you used the stamps! Beautiful layout! I love the colors and I had also thought that those stars were priceless and could be used in so many ways! Thanks for showing me a really fun possibility! Thanks for always inspiring me! Great way to create an “non” holiday lay-out with the holiday stamps. This is such a cool page – love how you used the stamp set! Love how you combined stamp sets – great ideas! Love that you took what was geared as a holiday set and took it a whole new direction. This will help me use the set all through the year! wow, fabulous layout, gorgeous colors! Awesome layout, I like how you filled in the paper strips. Love your layout! Love the stamps!!! I love how you used this stamp set as your border! The colors were perfect for the layout. Well done! What a great page! 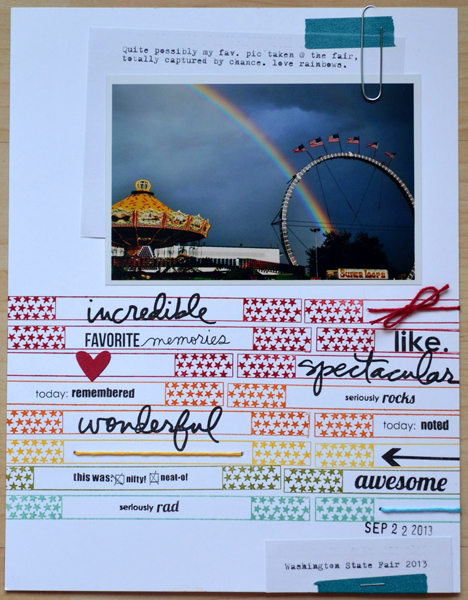 I love all the different ways you used the stamp with the sentiments, heart, twine, so fun! Totally love how you mixed things up and made it a non-holiday page! Way to think outside of the box! I really liked how you showed us that this stamp set can be used for all sorts of pages, not just for Christmas pages. I am very impressed how you did that! Love the use of this stamp set! Creative! Love the non-Christmas idea with this layout. And amazing picture. Thanks for sharing so many great ideas … you proved you don’t have to use a Christmas stamp only at Christmas!! Great layout & fabulous picture! I love rainbows too, and this layout is AWEsome! 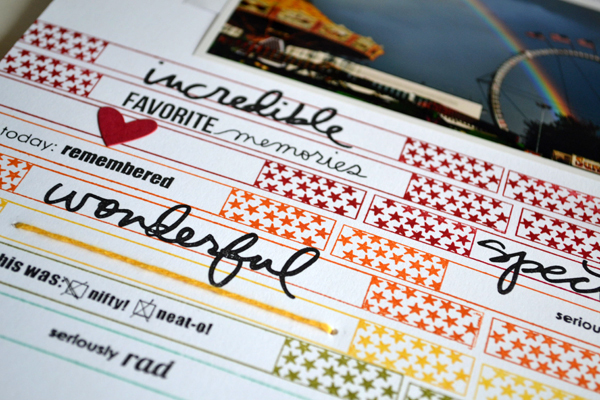 Love how you stamped these strips in rainbow colors – what a wonderful photo to capture! What a great way to use these stamps! What an amazing photo I see why it’s your favorite. Love the versatility of these stamps! Very creative! I love seeing how I can make this stamp set work year round! What a fun use of that stamp set! I love that it can be used for more than just holiday pictures. Love the rainbow and your use of the stamp! Another great idea for the stamps! Love the rainbow colors you used. I love love love the stars in the new set!! I love the rainbow you created! 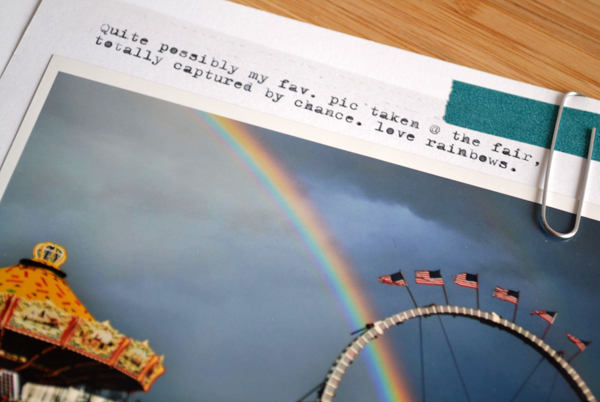 Such a wonderful layout – love how you coordinated the ink colors with the colors of the rainbow in the picture. I absolutely LOVE how you used these stamps for a non-holiday LO! Thank you! awesome as always Teri, I always enjoy seeing what you come up with. Totally unexpected here in the hop. Totally cool. Fabulous LO! Loving how you used the stamps in this LO! Great picture! Love how the other sentiments coordinate with the new stamp set. Awesome scrapbook page! I love that photo and how you used those cool stamps – perfect!! Teri, I love your Layered Hello Card from the latest Paper Crafts mag. Super adorable! Thank you for the inspiration. Love that you’ve used this for a non Christmas layout. Love the way you showed a different use for these stamps. Wow, what a great shot! Amazing page. What a cool photo op!!! Lovely against the carnival rides. LOVE your LO. The rows and rows of stars in the rainbow colors look great. Also, really like the look of the old typewritten journaling. Very cool page! Love all the colors and all those fun stars! Great stamp set! Can’t wait to get it! What a fabulously eye-catching layout! You are very clever. Just might have to steal this! that is the most incredible photo! love the non christmas use of the stamps, too.